Prominent & Leading Exporter from Mumbai, we offer banana silk yarn for knitters, multicolored banana silk yarn in assorted colors, banana silk yarns for knitters, banana silk yarns in balls, banana silk yarn in multicolors and banana silk yarns in multicolors. 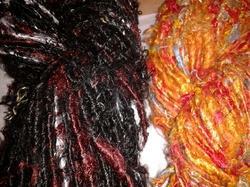 Multicolored Banana Silk Yarns available in a huge assortment of colors. Banana silk Yarns available in a large assortment of Plain Colors. Red Color Banana Silk Yarn suitable for Knitting. Turquoise Colored Banana Silk Yarns, also available in many other colors. Single Colored Banana Silk Yarns available in a large assortment of Colors. Multicolored Banana Silk Yarn available in a large assortment of Grammages..Banana Silk Yarn is Also available in Plain Colors as per Client Specifications. 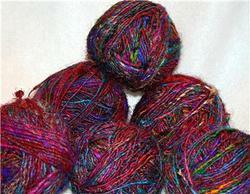 Multicolored Banana Silk Yarns available as Skeins and Balls. Banana Silk Yarns are also available in Plain Colors as per client specifications. 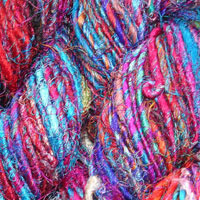 Our Multicolored Banana Silk Yarns are very Popular. Banana Silk Yarns available in Skeins of Various sizes. Banana Silk Yarns are available in Ball Shapes of Various Gram mages. Our Banana Fiber Silk Yarn is available In Single Colored Shades also.Banana Fiber Silk Yarn Suitable for Hand Knitting. Our Banana Silk Yarns are available in a large assortment of colors. Banana Silk is mix of Silk Fibers with Viscose Yarns. we manufacture a large range of custom made banana silk yarns in multi and plain colors. Banana fiber silk yarn suitable for hand knitting. Our banana silk yarns are available in a large assortment of colors. 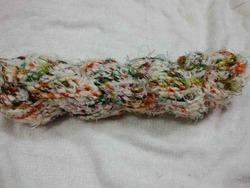 Banana silk is mix of silk fibers with viscose yarns. Banana silk yarns are available in ball shapes of various gram mages. Our banana fiber silk yarn is available in single colored shades also. Banana fiber silk yarn suitable for hand knitting. Our banana silk yarns are available in a large assortment of colors. Banana silk is mix of silk fibers with viscose yarns. Banana Silk Yarns are also available in Plain Colors as per client specifications. 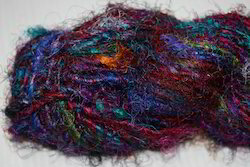 Our Multicolored Banana Silk Yarns are very Popular. Banana Silk Yarns available in Skeins of Various sizes. Banana Silk Yarns are available in Ball Shapes of Various Gram mages. Our Banana Fiber Silk Yarn is available In Single Colored Shades also.Banana Fiber Silk Yarn Suitable for Hand Knitting. Our Banana Silk Yarns are available in a large assortment of colors. Banana Silk is mix of Silk Fibers with Viscose Yarns. 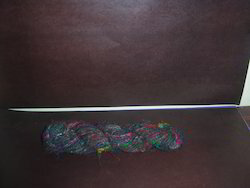 Multicolored banana silk yarns available as skeins and balls. Banana silk yarns are also available in plain colors as per client specifications. 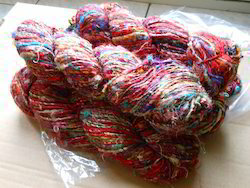 Our multicolored banana silk yarns are very popular. Banana silk yarns available in skeins of various sizes. Banana silk yarns are available in ball shapes of various gram mages. Our banana fiber silk yarn is available in single colored shades also. Banana fiber silk yarn suitable for hand knitting. Our banana silk yarns are available in a large assortment of colors. Banana silk is mix of silk fibers with viscose yarns. Sequin Decorated Photo Albums made from Handmade Paper. Dried Flower Photo Album available in a large variety of Cover Options. Brocade Fabric Covered Photo Albums available in a wide variety of designs. Sequined Cover Handmade Paper Photo Albums with fancy designs. Dried Flower Photo Album Available in a Large variety of sizes. Patchwork Fabric Covered Photo Albums available in a wide variety of sizes.Silk Screen Printed Handmade Paper Photo Albums. Foil Printed handmade Paper Photo Albums available in a wide variety of Cover Options. Block Printed Fabric Covered Photo Albums in Assorted Designs. Fabric Covered photo Albums available in Various Sizes.Our photo albums are available in a large range of Cover Options We also manufacture a large range of Photo Albums. Our Photo Albums are available In a large variety of sizes. Our Photo Albums are available with Tissue Paper Liners. Our Photos Albums are available with a large assortment of cover options. Single Colored Banana Silk Yarns available in a large assortment of Colors. 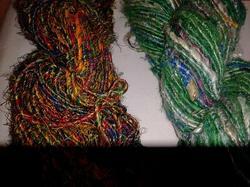 Multicolored Banana Silk Yarn available in a large assortment of Grammages. 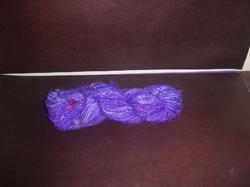 Banana Silk Yarn is Also available in Plain Colors as per Client Specifications. 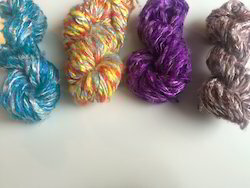 Multicolored Banana Silk Yarns available as Skeins and Balls. Banana Silk Yarns are also available in Plain Colors as per client specifications. Our Multicolored Banana Silk Yarns are very Popular. Banana Silk Yarns available in Skeins of Various sizes. Banana Silk Yarns are available in Ball Shapes of Various Gram mages. Our Banana Fiber Silk Yarn is available In Single Colored Shades also.Banana Fiber Silk Yarn Suitable for Hand Knitting. Our Banana Silk Yarns are available in a large assortment of colors. Banana Silk is mix of Silk Fibers with Viscose Yarns. Banana silk Yarns available in a large assortment of Plain Colors. Red Color Banana Silk Yarn suitable for Knitting. 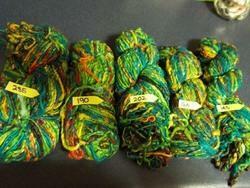 Turquoise Colored Banana Silk Yarns, also available in many other colors. Single Colored Banana Silk Yarns available in a large assortment of Colors. Multicolored Banana Silk Yarn available in a large assortment of Grammages..Banana Silk Yarn is Also available in Plain Colors as per Client Specifications. 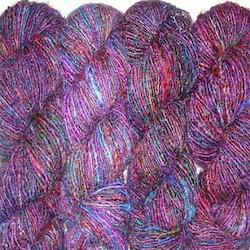 Multicolored Banana Silk Yarns available as Skeins and Balls. Banana Silk Yarns are also available in Plain Colors as per client specifications. 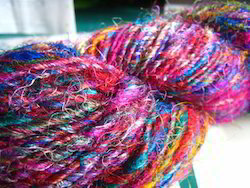 Our Multicolored Banana Silk Yarns are very Popular. Banana Silk Yarns available in Skeins of Various sizes. Banana Silk Yarns are available in Ball Shapes of Various Gram mages. Our Banana Fiber Silk Yarn is available In Single Colored Shades also.Banana Fiber Silk Yarn Suitable for Hand Knitting. Our Banana Silk Yarns are available in a large assortment of colors. Banana Silk is mix of Silk Fibers with Viscose Yarns. 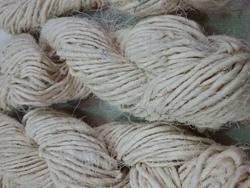 Looking for Banana Silk Yarn ?